he made off my website. I never got an answer and dont herd from that guy again. I get screwed over by Audi and another car brand use my website to screw Audi. This makes me laugh every time I think about it. A lot of other website forums chat about Myaudittsucks.com then get Audi to advertise on there forums. Audi try to covers up their customer complaint by buying advertisements. 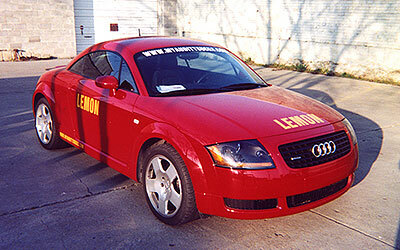 To: Charlie CantuSubject: Re: Lemon Law - AudiAnthony, I got your phone call - thanks! and they never talked to me again. Subject: news 8 wfaa inquiry One of my co-workers say yor t-shirt. are you a local dallas person? A month latter I see VW and Audi TV ads from the dealership that ripped me off. > get treated any better. > Is there a number to reach you at? After getting this email from the Washington Post. No interview happened.